Watermere Barn01263 715779work01603 870304fax Self-cateringWatermere Barn has been restored to retain original features, is a comfortable and attractive property situated in the village of Briston which is on the edge of Glaven Valley in North Norfolk. It is an ideal place from which to explore coastal towns like Sheringham and Cley, market towns like Holt and the villages of Heydon and Stody. There are national Cycle Routes near Briston as well as North Norfolk Steam Railway from Holt to Sheringham. • Other: Bed linen, towels and travel cot provided. 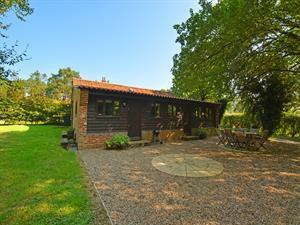 Watermere barn is a single storey wood clad barn in an idyllic peaceful location. Watermere Barn has been restored to retain original features, is a comfortable and attractive property situated in the village of Briston which is on the edge of Glaven Valley in North Norfolk. It is an ideal place from which to explore coastal towns like Sheringham and Cley, market towns like Holt and the villages of Heydon and Stody. There are national Cycle Routes near Briston as well as North Norfolk Steam Railway from Holt to Sheringham.